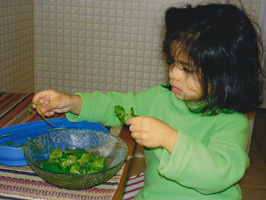 Children are more interested in food when you involve them in preparing it. 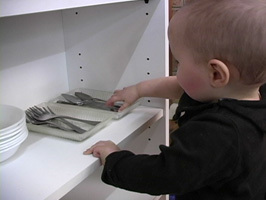 Provide child-sized utensils - cups, bowls, knives, forks, spoons, jugs etc. Place these in a cupboard that is low enough for your child to access for himself with doors that he can easily open. 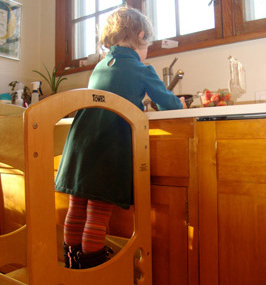 Provide a sturdy but light stool that your child can put in places that will give him access to the work surfaces. Your child can contribute to preparing meals by doing simple tasks like scrubbing a potato, cleaning a carrot or cutting a banana using child-sized utensils. Demonstrate how to do this by slowing down your movements and breaking more complex movements into simple steps so your child can see what to do. When he has finished show him, in the same way, how to wash up the things he has used and put them back in their special place in his cupboard. Your child will not work at the same pace as you but this does not matter. He is doing it to be involved and you will probably have to scrub 6 potatoes to his 1 if you want to eat at a reasonable time!